Shrinking or reduction in volume occurring in almost all metals and alloys from the beginning of solidification until cooling to room temperature. In addition, we also speak of dry shrinkage in mold materials and refractory materials at a certain time. The specific volume of the common casting materials is higher in liquid state than in solid state. Therefore, these materials undergo contraction during solidification and cooling. During this process, a volume deficit in three stages occurs, as shown in Fig. 1. All casting materials have a lower density in molten state than in solid state. 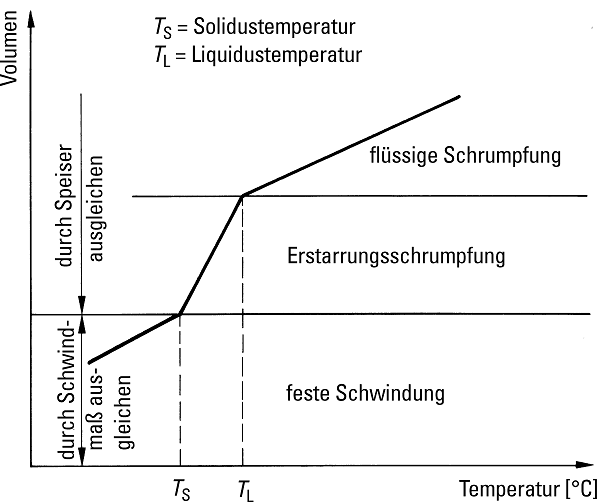 This results in a progressing volume contraction (liquid shrinkage) during cooling to the liquidus temperature, followed by a further, abrupt decrease in volume during the solidification interval (solidification shrinkage), and finally a third volume contraction in the solid state during cooling to room temperature. The liquid shrinkage is normally irrelevant, as it is compensated automatically by a corresponding casting system and the communicating compensation of the liquid material in the casting mold. 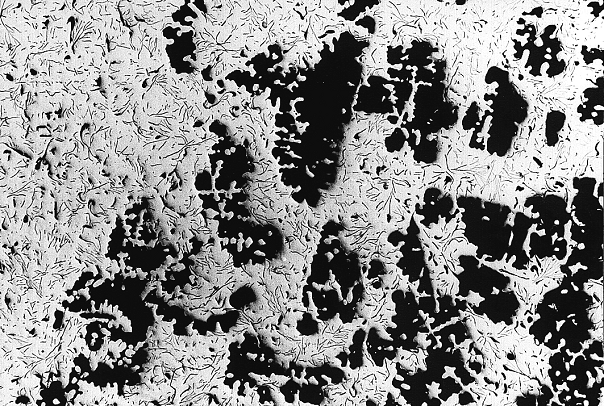 The solidification shrinkage (second stage) leads to a volume deficit and to formation of (shrinkage) cavities (Fig. 2). Casting-related measures, such as the use of corresponding risers etc., must be implemented here to ensure that cavity formation takes place outside the casting. Guide values for the cavity volume of some casting materials are provided in Table 1. The solid shrinkage (third stage) is insignificant and is compensated by allowances on the pattern and/or mold (s. Shrinkage allowance).